That's a key takeaway from a new University of Vermont study that shows, for the first time, that the impacts of farmers' manure use decisions extend beyond the growing season to influence emissions on warm winter days. “This could have big impacts as winters become warmer and soils thaw more frequently,” said lead author Carol Adair, of UVM's Rubenstein School of Environment and Natural Resources and Gund Institute for Environment. “If croplands move farther north with warming climates, this could increase the contributions of agriculture to global GHG emissions." 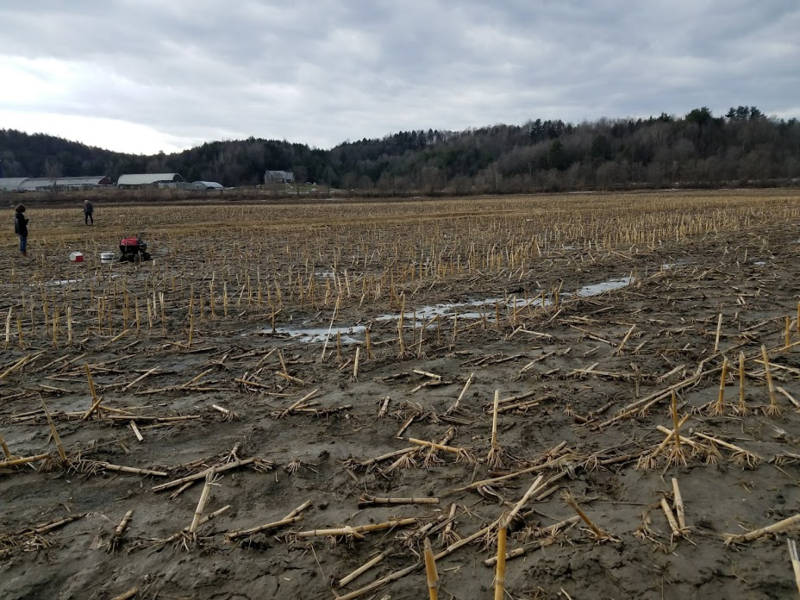 The study, published in Soil Science Society of America Journal, provides some of the first measures of GHG emissions from agricultural soils in Vermont and highlights important trade-offs with current agriculture practices, such as injecting manure into soils. While it’s known that farmers’ decisions to add nutrients to their fields affects greenhouse gas emissions during the growing season, Adair and colleagues find that these choices have long-lasting effects: they can increase emissions of powerful greenhouse gases, especially nitrous oxide (N2O), during wintertime thaws. Emissions of GHGs (CO2 and N2O) from agricultural soils have been well-studied during the growing season, much less so during winter. Understanding the lasting consequences of management decisions is becoming more critical, as agriculture is expected to expand and intensify in northern regions as the climate warms, researchers say. Researchers conducted a laboratory study on frozen soils collected from field trials in Vermont. The agricultural lands received different methods of manure application (broadcast, broadcast plus incorporation by plow, and injection) during the growing season. In the lab, researchers subjected soil cores to either a frozen, freeze/thaw, or thaw treatment for eight days. The research team found that the method of manure application strongly impacted emission rates of CO2 and N2O – a GHG roughly 300 times more powerful at trapping heat than CO2 – from soils. During winter thaws, N2O emissions from manure-injected soils were up to 20 times greater than emissions from soils with surface broadcast or broadcast plus plow manure application. Release of CO2 and N2O was up to eight times greater from soils that thawed than from soils left frozen, but this varied depending on manure application method. Nitrous oxide emissions from injected soils were 2-3 times greater than from soils broadcast with manure and 4-19 times greater than from soils broadcast and plowed. The type of manure application also affected CO2 but not nearly as much as it affected N2O. “This study gave us an incredibly useful launching point for expanding this research, and enabled us to work with more Vermont farmers,” said Lindsay Barbieri, PhD student in the Rubenstein School and Gund Institute. “Together we're monitoring GHG emissions, alongside water quality, crop yield, and other measurements, from agricultural soils and practices. This is happening directly in the field, for longer periods of time, as we work to better understand the complexities of agricultural practices and the role of GHG emissions in Vermont."